MEXICO CITY, Mar 19 (IPS) - Minerva Montes lost her home on Holbox Island in 2005 when Hurricane Wilma hit the Yucatan Peninsula in southeastern Mexico. Rebuilding her home was quicker and easier than overcoming the psychological aftermath of the catastrophe. "They activated the evacuation alarm, I didn't know what to do, I packed my things and put them on the ground floor, because I had heard that the wind didn't hit there. But I didn't know then about the effects of the flood," she said. Montes, who is involved in wildlife rehabilitation, had just moved to the island a year earlier. The island, located about 1,600 kilometers from Mexico City and home to some 2,000 people, forms part of the municipality of Lázaro Cárdenas in the state of Quintana Roo. And she had only been living in a house on the edge of the beach for a few months. Montes, whose adult son no longer lived with her, took temporary refuge in the town of Tizimín, in the neighboring state of Yucatán, waiting for the emergency to pass and for her partner to return from abroad. A week later, she returned to what had been her home. "What we saw was shocking, there were holes in the ground everywhere. I had the suspicion that I was not going to find anything (of the house). There were no walls, only the roof was still there. Everything I had put away to protect it had disappeared," she told IPS during a trip through the Yucatán peninsula to observe how the local population is adapting to climate change. Montes, who turned her nearly demolished house into a small hotel, sensed that the worst was coming, although she did not describe what she felt as fear. "You're left with the feeling that you're starting over. It was a hard and painful experience. It is not easy to be the victim of a disaster," she said. Hurricane Wilma, which reached a category 5 force due to the speed of its winds and the volume of rain dumped, making it one of the most powerful of the 21st century, hit Mexico's Atlantic coast from Oct. 21-23, 12 years ago, to continue its destructive path towards the U.S. state of Florida. Millions of people have suffered the same experience, exposed to the onslaught of climate change and its psychological consequences, which require attention and can become a public health problem as storms, floods, droughts and heat waves become more severe. Mexico is highly vulnerable to the consequences of climate change. A total of 480 Mexican municipalities are especially exposed to the phenomenon, of the 2,457 into which the country is divided, according to a report by the government's National Institute of Ecology and Climate Change (INECC). The risks, the study estimated, threaten more than 50 million people, out of a total population of 128 million. 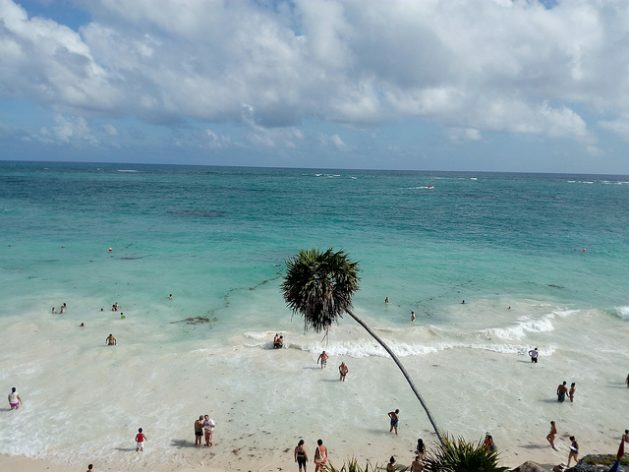 Particularly vulnerable to global warming, the Yucatán peninsula, which includes the states of Campeche, Quintana Roo and Yucatán, plays a vital climate role, as it is home to rainforest that regulates water flow and temperatures in the region. This year, springtime began a month earlier than usual, surprising people with unusually high temperatures in several areas of the country, while the weather service is now forecasting rain in the coming weeks. The latest official data confirms that this country is the second biggest emitter of greenhouse gases (GHG) in Latin America, following Brazil, with the launch into the atmosphere of 446.7 million net tons, according to figures from 2016 published last year by INECC. For Jorge Álvarez, coordinator of the Crisis Intervention Programme for Victims of Disasters in the psychology department of the National Autonomous University of Mexico, the impact is important and the situation is only going to get worse, since the climate roulette unleashed by human activity continues to spin. "The first thing is to save lives and get people into safe places. And after that comes the psychosocial intervention. What we pay a lot of attention to is the kind of reaction they have to such an extreme situation. Some people manage to overcome the situation on their own and help others, whole others continue to feel panic," he told IPS. Frequent symptoms include sleep disturbance, panic attacks, and post-traumatic stress disorder, which "if not resolved soon, require specific assistance." While Mexico has made progress in issuing early warnings for other climate events, as well as in its rapid disaster response system, the mental health of victims could become a critical issue. This country ranks among the 10 nations and territories in the world with the highest absolute disaster losses, amounting to 46.5 billion dollars from storms, on a list headed by the United States, with 944.8 billion in losses. This is indicated in the 2018 report "Economic losses, poverty and disasters 1998-2017", produced by the United Nations Office for Disaster Risk Reduction and the Centre for Research on the Epidemiology of Disasters of the School of Public Health of the Catholic University of Louvain, Belgium. Between 2000 and 2019, Mexico issued 2,145 emergency, disaster and extreme weather warnings, 1,998 - or 93 percent - of which were in response to hydrometeorological events, while the remaining seven percent responded to geological, chemical and health problems. On the other hand, according to the government's National Risk Atlas, natural and man-made disasters have left a death toll of at least 7,700, more than 27 million people affected by losses and more than 21 billion dollars in damage. The DN-III-E Plan, implemented by the Secretariat (ministry) of National Defence in disasters, includes immediate psychological care, but is ambiguous as to the follow-up of victims. The link between these events and climate change is already attracting the attention of academia. The study "Higher temperatures increase suicide rates in the United States and Mexico," published in the scholarly journal Nature Climate Change in July 2018, found that the suicide rate increases 0.7 percent in U.S. countries and 2.1 percent in Mexican municipalities for each one degree Celsius rise in average monthly temperature. The authors of the report, researchers based in universities in Canada, Chile and the United States, compared temperature and suicide data from hundreds of counties and municipalities between the years 1990 and 2010. They also studied depressive language in more than 600 million social media updates to assess whether hotter temperatures affected mental well-being. "This effect is similar in hotter versus cooler regions and has not diminished over time, indicating limited historical adaptation," says the report, which projects that "unmitigated climate change" could lead to between 9,000 and 40,000 additional suicides across the United States and Mexico by 2050. Montes is afraid another disaster could happen.. "A category 4 or 5 hurricane could wipe out everything. It frightens me to think about what could happen to people, the wildlife and vegetation. If the island disappears, there is no plan B, where to go? who to go to? I'm in a more vulnerable situation than if I lived in a city," she lamented. She says the government should provide more assistance. "Psychological support is essential, because people need to regain emotional security. The fear of losing one's life, one's health, everything you face afterward, paralyses you," she said. According to Álvarez, psychological follow-up and prevention are fundamental. "Disasters also involve socio-organisational aspects, which include many factors. A disaster aggravates existing conflicts," he said.